HIGH TECH UPF 30 - Our tube bandanas offer UV sun protection, as well as protection against the other elements - rain, wind, cold, snow, dust. ONE SIZE FITS ALL - These fishing bandanas stretchable and comfortable, perfect for men, women, boys and girls, and even dogs! HIGH PERFORMANCE MOISTURE WICKING MATERIAL AND BREATHABLE - Our seamless bandanas are 100% Polyester Microfiber. GUARANTEED SATISFACTION: Our headbands always come with a 100% money back guarantee, no questions asked! Click ADD TO CART to rock your bandana today! 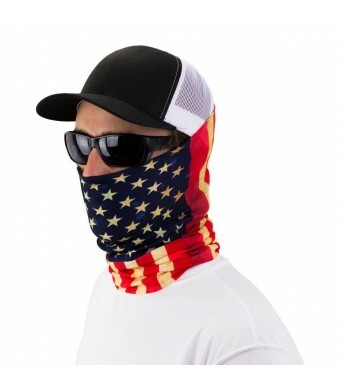 This American Flag Bandana is perfect for fishing, hunting, shooting, running, mountain biking, cycling, walking, hiking, camping, paddling, paintball, traveling, tailgating, skiing, snowshoeing, snowboarding, cross country, gardening, construction, landscaping, yoga, pilates, crossfit, P-90X, soccer, tennis, basketball, baseball, football, lacrosse, track and field, and more! 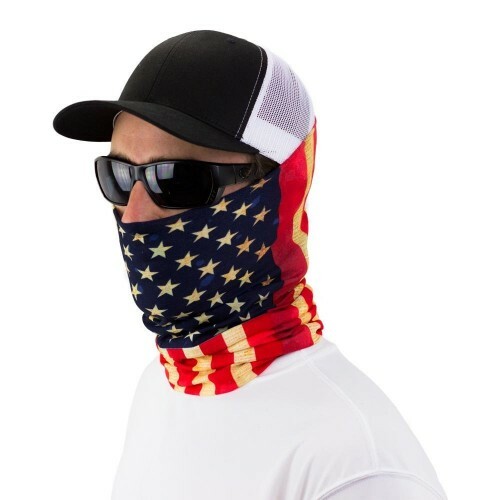 Sport your USA Bandana for July 4th, Memorial Day, Flag Day, Labor Day, Presidents Day and other patriotic holidays and parties! Perfect for the beach, mountains, desert, trails. Our tubular bandanas can be worn as a bandana, neck gaiter, balaclava, helmet liner, face mask, headwear, scarf, headband, scrunchy, headscarfs, wrist wrap, beanie, pirate cap, beret, ponytail holder, neck warmer and more! Why Choose Hoo-Rag? Our bandanas are made of premium, high quality material like no other brand! These tough and durable Hoo-Rags can be used season after season. Check out our over 150 designs! We offer designs such as fishing, camouflage, paisley, snowboarding, chef/cooking, skulls, flags, tactical/military (USMC/Marines), biker/motorcycling, dogs, cartoons, college sports teams. Represent the United States of America and Click ADD TO CART now for your very own USA bandana!